3-5 weeks due to Many Orders and Moving Shops. Please Email for Current Wait. Hand Made Silicon Fuzz Pedal. 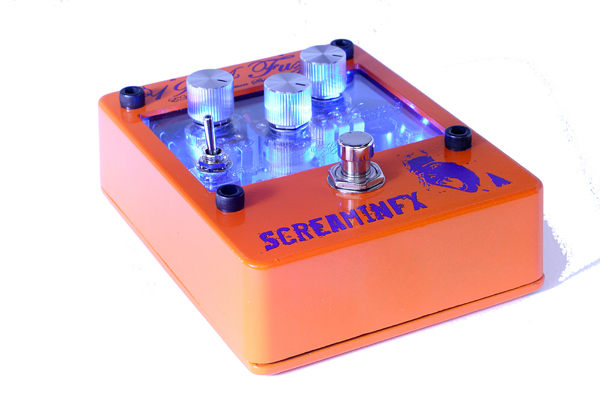 Gain matched and ideal for use with a Wah Wah for Screamin Tones. Intense, affordable hand made silicon pedal that sounds like germanium for solid fuzz tone: I designed this to sound like a high end matched germanium fuzz pedal without the price tag. It lives up to this big time. Useable Instead of being super fuzzy and high gain like some fuzz pedals, this pedal is tuned down a little so that you can hear the notes you are playing. This makes a HUGE difference. Doesnt lose guitar treble and preserves the full range of your wah wah before fuzz: I designed a special inline buffer that allows you to use a wah pedal before the fuzz which is ideal for full wah range. It can be switched off using a true bypass switch which enhances volume knob sensitivity. The 1954 wont lower your stage volume if you turn the fuzz down on the pedal. It has an extra boost built in if you want to be LOUD! Extremely pick sensitive. Additionally, it cleans up really well with the volume rolled back on your guitar. I designed it with an emphasis on playability and it uses a minimum of transistors in your signal path which highlights your guitar technique and nuances. Finely tuned silicon fuzz using distortion tone shaping techniques. All new TONE pot allows you to dial in your exact tone. Vintage tone with completely analog design. Silicon transistor based fuzz circuit. Comes with ScreaminFX return policy - full refund if you email me and then return like new within 30 days. I think it is really important to try it with your own rig. For the 1954 Fuzz Pedal, I wanted to see how close I could get a silicon fuzz to sound like a vintage germanium fuzz. The reason was so that I could sell a really awesome fuzz pedal, but at a reduced cost compared to hand selecting germanium transistors. The goal was to make a very useable fuzz - one that you can hear all the notes when you play a chord instead of a big mess. In my opinion, this pedal very successfully achieves these goals. If you are wondering, I do a lot of research on RF power amplifiers like those in your cell phone, so I used techniques from them in this pedal design. Additionally, the 1954 Fuzz uses very few transistors (only 4 at the max) which means that your subtle inflections and guitar playing style will come through. It took me almost 2 years of tinkering to get it right. You will love it. First Problem Fixed: Fuzz Pedals don't sound great with other pedals in front of them, especially a Wah Wah. 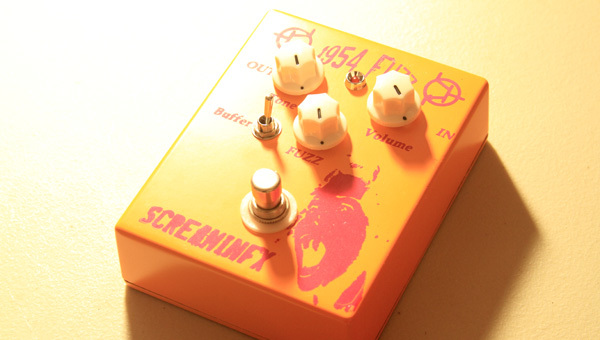 Solution: I made a custom buffer called FuzzSAFE™ and WahSAFE™ that works extremely well with my 1954 Fuzz Pedal. It adds a little more treble that you were losing. Additionally, you can put other pedals in front and you don't have to worry about the Fuzz sound going south and sounding terrible. It sounds awesome, especially with a Wah Wah because you can get a full Wah range that you normally miss out on. Think Hendrix in his Band of Gypsies stage. This buffer is attached with a true bypass switch, so when its off, its off and not in your guitar path. Second Problem: When you turn on a Fuzz, it is often not as loud as your stage volume. Solution: I hate pedals that aren't loud enough, so with my Fuzz pedals I added a clean gain stage that doesn't alter the fuzz sound over most of the range unless if is used as an overdrive. It is designed for a 6dB boost, which is a lot of clean boost. 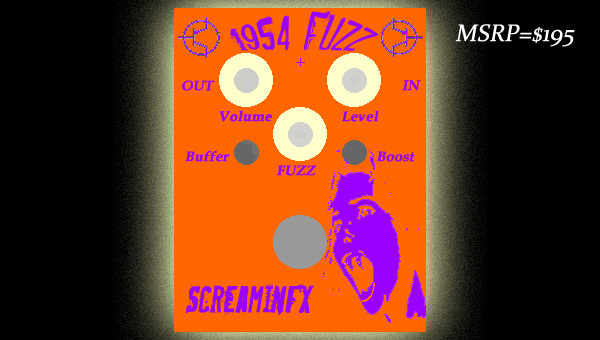 You can make the 1954 Fuzz as loud as you want and never loose your stage level. Additionally, because you can make it so loud, you can turn down the actual fuzz circuit and get new overdrive sounds that were unachievable at stage volume levels before. 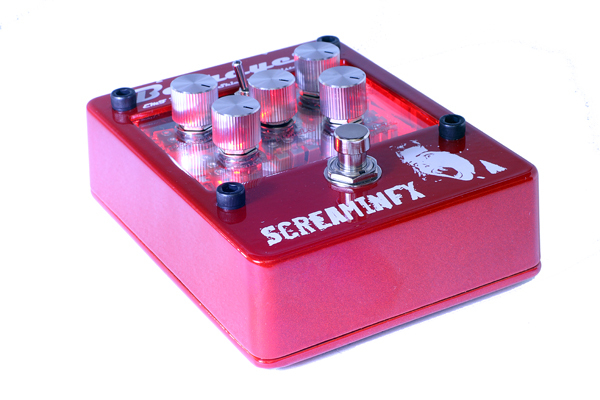 This clean boost is attached with a true bypass switch, so when its off, its off and not in your guitar path. A note about the power supply: The way the guitar signal of a Fuzz pedal sees ground is through both the ground and the power supply. Instead, I usually recommend just running vintage fuzz pedals off of a battery but I did tune this one so that you could add an external supply if you really want. However, this pedal consumes very little power (less than 4mA!) and will last for many hours on a single battery (>100 hours) . My personal preference is to use a cheap battery from the dollar store. I use Sunbeam and they are normally two for a dollar. One thing you can try out is to use different voltages as the supply. It will sound very different with a 3V supply but will still be useable - try it out! 30 Day No Hassle Money Back! You need to try the pedals on your rig at home or on stage. If you buy one and it is not for you, please send it back unharmed and I will refund the purchase price no problem. USA Shipping It usually takes 2-3 business days using USPS Priority Mail to get there and I will email you about the shipment. Domestic Shipping is $8. International It costs more to ship internationally but I have sent pedals everywhere. 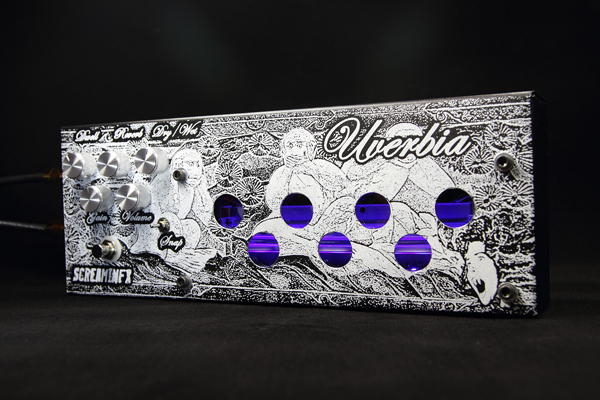 The added cost for this pedal is $20 to ship it USPS first class (please use the dropdown menu on the order button). This shipping takes about 3-4 weeks and depends on customs in your country. There is also a priority option, please email me but this is usually at least $40 and the pedal will arrive in 6-10 business days. If you have any questions or concerns please email me using the contact form. Delay Due to Backorder I will let you know immediately if the pedal you order is not in stock. I usually try to have several ready to go, but please remember that I build each one by hand. Then I test them to make sure they are exactly how I want. The hardest part is not rocking out for a long time when I test them! At 5:00 Fuzzsafe buffer demonstration - get treble back.